As a parent who just spent a full day’s worth of mental and physical energy packing, parking, checking bags, reading monitors, and navigating airport security without forgetting one of your kids on a conveyor belt somewhere, pay attention! Because this spiel is a valuable reminder to make sure you’re actually getting on the right plane. This is also a good time to check that you’ve taken advantage of every single loophole, perk, and freebie your airline is willing to throw at you. For example, people flying with children can check car seats for free, drop their strollers off right at the gate, and even bring kids’ drinks like milk, juice, and water through security (although they will run some sort of CSI-style, high-tech chemical test on them, so get the idea of smuggling vodka in a sippy cup out of your head right now). Also, it’s an attractive notion that babies younger than two years old fly for free if you keep them on your lap the whole time. But just keep in mind that after a few hours, that extra seat might actually be worth $500 to you. Hooray! They’re letting you get on the plane first! Actually, they probably aren’t. Airlines don’t let families board early as much as they used to. Instead, they’ll let lots of people on before you: passengers in wheelchairs; servicemen and women in uniform; anyone in first class; anyone in business class; frequent fliers with so many miles that they get to be members of some fancy-sounding club featuring words like Elite, Platinum Plus and Medallion; A-list celebrities; and even Dancing With the Stars-caliber “celebrities,” to name a few. Since these are your last moments of freedom before being trapped in a crowded metal projectile with your kids for several hours, you’ll want to make good use of this time. Change diapers and take potty breaks. Get those little gate-check tags on your stroller and car seat, so the airline staff doesn’t glare at you for not already having them when you start down the walkway. And maybe let your little ones run around the gate area or food court to get some energy out. Unless that’ll get your kids more wound up, and harder to keep in their seats later. You know them best, so choose wisely. If you’re concerned about your kids’ runny noses, giving them some cold medicine right about now might make them feel better (and drowsier, if that’s your aim) during the flight. But if your kid is seriously sick, see a doctor ahead of time to make sure it’s safe to fly at all—nobody needs a ruptured eardrum, people. Ignore the fact that every flight is either full or not full, which makes the word “extremely” extremely unnecessary here. This is code for you to know that you will not have a free extra seat for you and your family to spread all your crap out in like you’d hoped. Psychologically, it’s probably best to prepare for the worst and not even bother hoping for the best in situations like this anyway. So go ahead and assume the airline will somehow assign non-reclining middle seats to your entire family now, and you just might be pleasantly surprised later. If your partner is traveling with you, it’s also a good psychological move to divide and conquer kid responsibilities. Parenting is tough even in the best of circumstances (and flying is the exact opposite of the best of circumstances), so be sure to give each other lots of support and plenty of breaks. No, you can’t stuff your kids up there. And since shuffling into the aisle and futzing through those bins mid-flight isn’t always easy, don’t stow anything that your needy little leeches might have to have right this very minute either. Instead, set up an arsenal of kid-focused in-flight necessities right in your row, right now. Since your children are short, you might even be able to shove it all in front of their seats, leaving you with some well-deserved legroom. This is a big one, since it tells you exactly how long you need to try to keep your kid in a calm, contented, not-shouting-or-crying-or-kicking-the-seat-in-front-of-you state. The bad news is you might have already failed at this before you even printed out your boarding pass. Because if your kid is currently unable to sit still through dinner, the odds are slim that he’s going to make it halfway across the country without completely freaking out. If you feel your kid needs it, try giving him a little “airplane training” in the weeks leading up to flight. Picture a typical Rocky training montage, except replace Sylvester Stallone punching meat, chopping down trees, and catching chickens barehanded with your child sitting quietly at the library, sitting quietly in church, and sitting quietly at a restaurant. The more practice you can give your child behaving in airplane-like environments, the better. No time for a montage? 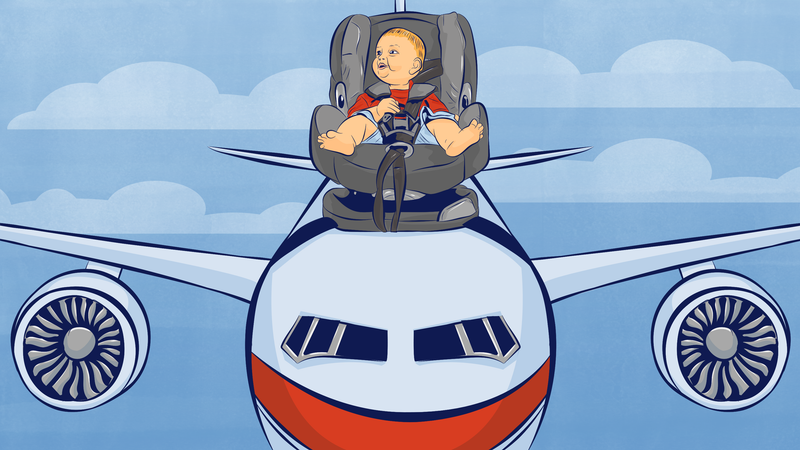 You can still help whip your kid into flight-ready shape by simply talking to him about it. Kids can understand a lot more than we usually give them credit for, and letting your little dude know that you expect him to be able to sit on the plane for a long time without getting up might actually help him do it. So now we arrive at the question of what items you should bring to keep your kids occupied. We recommend packing this whole list, but using them one at a time, and only when absolutely necessary. Wait until they’ve completely lost interest in whatever they’re doing currently before bringing out something new. Because the last thing you want is to have blown your entire kid-entertaining wad before the captain has even turned off the seat-belt sign. If you think this list isn’t enough, don’t be afraid to bring out the big guns, too—like your movie- and game-filled iPad. But don’t think tossing your kids the tablet for a full six hours is a good idea. Studies have shown that too much screen time can limit kids’ ability to learn and develop bonds with you. Plus, they might get sick of it (or the battery might die) sooner than you expect, so you’ll be screwed if that’s all you brought for them to do. And perhaps most importantly, letting them go that nuts with the electronics is only going to build up their tolerance to it. Once your children have become numb to the highest highs available to them, how are you possibly going to calm them down next time you really need to? A better plan would be to treat the iPad as a last resort—and a reward for prolonged good behavior. Oh, and here’s one thing not to bring on the plane: gift bags for the people sitting around you, preemptively apologizing because your noisy kids are surely going to disrupt their flight. First of all, your kids might surprise everybody and act with nothing but courtesy, restraint, and self-aware compassion (or they at least might fall asleep for a while). And secondly, those people knew what they were getting themselves into when they bought their non-refundable coach-class ticket on a no-frills commercial airline. If they really wanted to fly in undisturbed silence, they would’ve bought their own private jets like everybody else. Encourage your kids to do this. They’ll just think it’s a totally cool comic book. And they’ll be pretty jazzed to learn that the plane has an inflatable slide on it, too. After they get through with the safety materials, hand them the SkyMall catalog as well. Turns out looking at page after page of insane, overpriced crap is a great time-killer for kids too. Is the only sippy cup in your possession right now filled with warm water and toddler backwash, per usual? Then you’d better brace yourself—and ask for a handful of extra napkins—because your child will be covered in apple juice within three minutes of the beverage cart serving your row. Your smarter option would be to bring an extra spill-proof cup for this exact moment, fill it with your child’s sticky, sugar-filled drink as soon as it’s served, and then crown yourself Parenting Genius of the Year. As for you, a giant coffee—or giant cocktail—might sound like just what you need. But should you order it? The correct answer depends on your ability to prevent hot beverages from spilling all over your children during extended stretches of turbulence, and your ability to keep competently parenting after alcohol hits your bloodstream. You be the judge. If your kids didn’t notice that the seat-belt sign turned off just now, don’t tell them. As soon as children realize they are no longer required by law to remain strapped in place, they will invariably insist on roaming the grounds and generally tearing the place up. To channel some of this limitless energy, try taking the kids for a walk. You can go to the restroom, check out where the crew keeps all the snacks and beverages, or just log a bunch of laps up and down the aisle. Of course, if you do this right after your kid has been just kind of screaming for awhile, prepare for a whole bunch of dirty looks. Warning: the flight attendants do not mean that they want you to hand them dirty diapers you’ve been changing at your seat all flight long. If you try to toss one of those into their precious little garbage bags as they walk down the aisle, they will contemplate unfurling that cool inflatable slide in midair and pushing you down it. That being said, carrying a baby to the restroom to change every single diaper is a sucker’s game. You can easily take care of the pee ones at your seat (poo ones, too, if you’ve got some serious diaper-changing game), then just stick them in barf bags before throwing them out—preferably on one of your aforementioned Kid Walks. But if it’s absolutely necessary to hand a dirty diaper to a flight attendant, just make sure you ask if it’s okay first. Just practice looking sheepish and apologetic. In fact, maybe you’ll need your own Rocky training montage, too. Andy and Amber Ankowski are parents of three, experts in child development AND childish fart jokes, and authors of Think Like a Baby: 33 Simple Research Experiments You Can Do at Home to Better Understand Your Child’s Developing Mind. Read their Doctor + Dad blog here.